Big Judo teaches Judo, grappling and self defence. The following paragraphs outline the team at Big's vision, our mission and the values that we will demonstrate. Grow Big Judo so that it becomes large enough to be strategically sustainable so that we can continue to achieve the first two objectives. Big Judo will provide excellent martial arts instruction that builds better people. Technical excellence - We relentlessly pursue excellence in our instruction. We expect our students to work hard to be the best they can at Judo. The Auckland University style of Judo fuses traditional 'Kosen' Judo with modern competitive Judo. It is characterised by a focus on grappling, ground-fighting and 'gameness'. Auckland University Judo Club produced four Olympic Judo players and is unique in New Zealand because of the close links it has with Mixed Martial Arts and Ju Jitsu. Rick spent the late 1960's and and 1970's training in Kyoto. His current Sensei is Isao Okano (Olympic Gold medallist and World Champion) and they were both instructed by Kimura Mitsuro (Mr Sankaku) and Ebi Goichi (the 'God of Ground-fighting). At the 1972 Olympics Rick achieved New Zealand's highest placing in Olympic Judo. This photo is of Rick and his training partners in Japan in the late 1960s. Rick is the one on the far right. 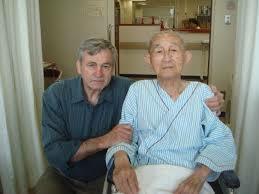 This is a recent photo of Rick and his old Sensai Kimura Mitsuro. At Big Judo we work to continue this legacy by instructing children and adults in Judo and Judo based grappling skills.